Those in charge of media plans, be it digital or traditional, are swimming in data. There isn’t enough time for a team to sort through, and take advantage of, the millions of data points available. Lucy delivers easily-available, action-oriented information that allows teams to be more nimble and responsive. She generates adjustable models and predictions across all media channels so planners can optimize their approach for the greatest impact. Feed Lucy a media mix and she can build 100s of adjustable models in minutes. 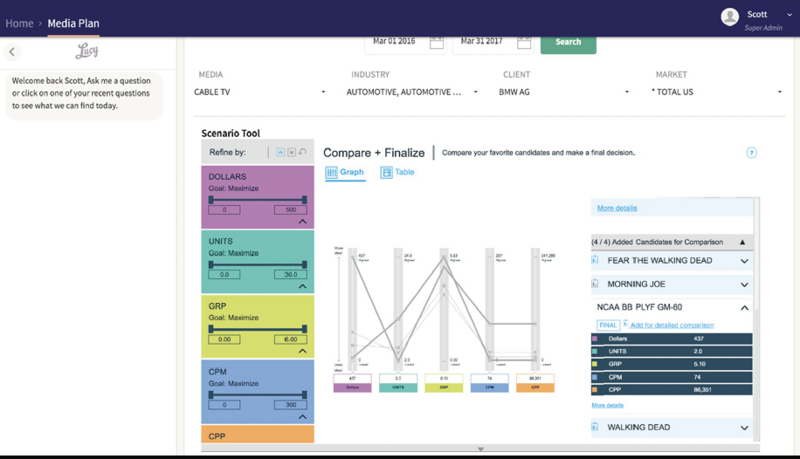 You can instantly compare and contrast the effects of different strategies across the full continuum of media options. 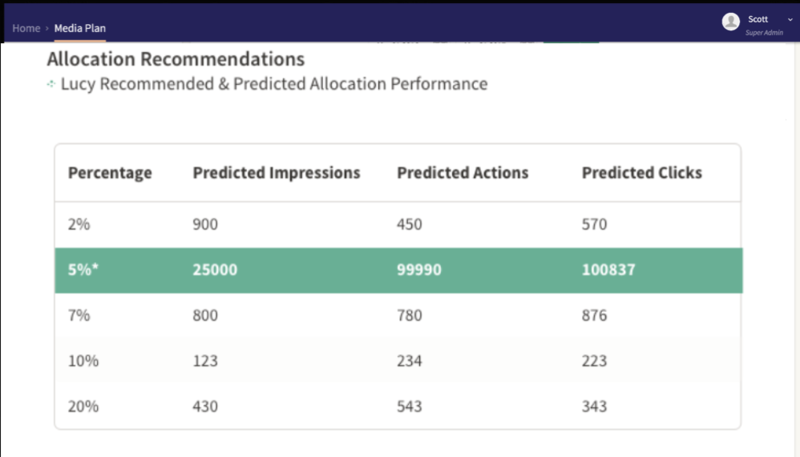 Lucy helps you understand your overall media allocations in conjunction with your objectives at a granular level. She generates important insights to achieving your media plan objectives—from high-level mix decisioning to an extremely localized level with the scale of 1000s of media plans by geography. 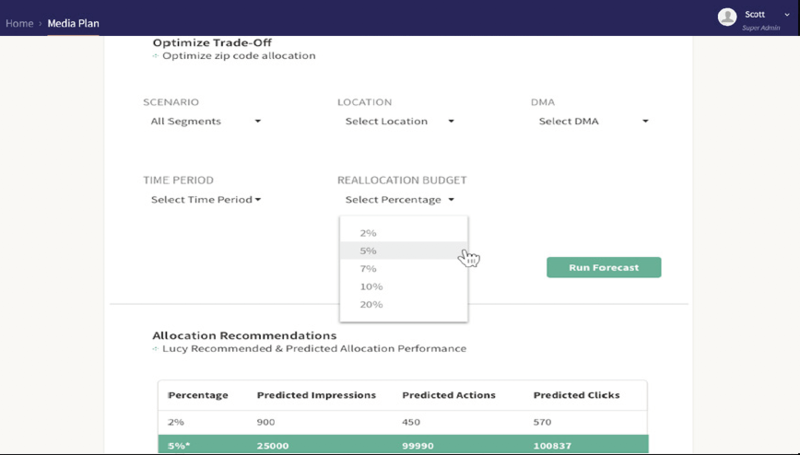 Lucy integrates disparate data sets including double-click, factual, and competitive to generate predictive models to forecast expected outcomes. Based on actual results, she continues to re-forecast and fine-tune her predictions to best meet campaign objectives. Through machine learning, she continuous to get smarter and more precise. A Global Media Agency tested Lucy's AI-powered media optimization feature. A digital campaign for a luxury auto manufacturer was in place and optimized with the agency's current tools. 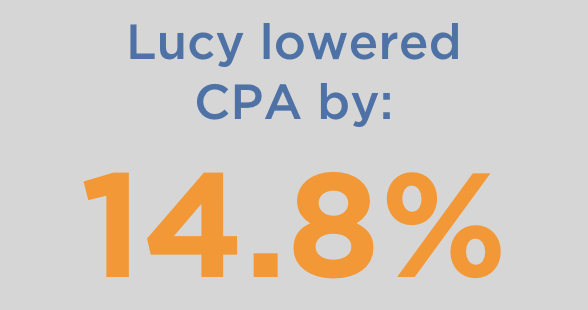 After establishing a successful baseline CPA, the agency then used Lucy’s predictive forecasting to guide the media buys.